THE mental and physical health of thousands of people living with Multiple Sclerosis in Northern Ireland is being put at risk by long waits for appointments with specialist doctors. That is the warning being issued today by the MS Society Northern Ireland. The charity is calling for a “fundamental system change” to deal with a waiting list backlog and to ensure equal access to treatment and services for all patients. The government targets are that no one should wait longer than 18 weeks for their first outpatient appointment and at least 60% of patients should wait no longer than nine weeks. The latest measure of performance for the quarter ending September 30th 2015 shows that Northern Ireland as a whole did not meet either of the outpatient appointment waiting time targets, nor did any of the individual health trusts. We looked specifically at neurology which is the medical speciality concerned with diagnosis and treatment of disorders of the nervous system, including MS. Our analysis shows that, as of September 30th 2015, 65% of the 11,268 people waiting to see a neurologist had been waiting over 18 weeks. And 80% had been waiting over nine weeks. Patients are also facing long review appointment delays with some taking place over two years past their intended review date. The MS Society said it has also obtained figures which show that 36% of people are waiting longer than a year past their consultant recommended check up date in Belfast Health and Social Care Trust. A leading neurologist told Detail Data that waiting times are “dreadful” and said more clinics, with multidisciplinary input, are needed to meet the demand. Dr Gavin McDonnell said there are no advantages to MS patients in delaying their diagnosis and treatment as brain and spinal cord function can be irreversibly lost. One woman living with MS told us that patients are upset, frustrated and concerned by the delays and that she feels she has been “written off”. 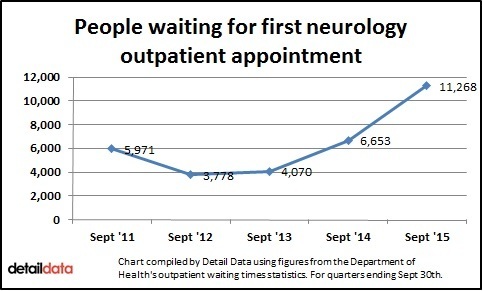 Health Minister Simon Hamilton said the reason for lengthy waiting times for neurology appointments is similar to many other specialities – the demand for outpatient consultations currently exceeds capacity – and that £40m secured in November’s monitoring round (when Stormont’s Executive reallocates unspent money) is to be spent on tackling waiting lists. The Minister added that “significant annual investment” is made every year in MS specialist drugs for patients in Northern Ireland with the current budget for the service in excess of £11m. “The Health and Social Care Board is not aware of any delays in patients diagnosed with MS commencing treatment for MS,” he said. In response, the MS Society stressed that waiting for initial diagnosis delays treatment starting. It is estimated that there are around 4,500 patients currently living with MS in Northern Ireland and 180-200 new cases are diagnosed here every year. Across the UK, more than 100,000 people have the condition. As of December 2015, there were 1,899 people on active treatment for MS in Northern Ireland. Symptoms usually start when people are in their 20s or 30s and it affects almost three times as many women as men. MS is a condition of the central nervous system caused when the coating around nerve fibres (called myelin) is damaged. This leads to a range of symptoms which commonly include vision problems, balance problems, dizziness, fatigue, bladder problems and stiffness and/or spasms. It is a lifelong condition but treatments can help to manage its symptoms. There are two main types of MS.
Around 85% of those diagnosed have relapsing remitting MS which involves distinct attacks of symptoms which then fade away either partially or completely. Primary progressive MS affects about 10-15% of people diagnosed with MS and symptoms gradually get worse over time, rather than appearing as sudden attacks. The progression of disability is much quicker for people with primary progressive MS and some may use walking aids or wheelchairs. The MS Society Northern Ireland is launching a manifesto today in Stormont's Long Gallery which calls for additional investment in MS services. Jenny Ruddy from the MS Society Northern Ireland said: “There needs to be a fundamental system change to ensure that people can get an appointment when they are newly referred into neurology if they have a suspected diagnosis of MS.
“Also if they have MS, patients need to be reviewed by their consultant when the consultant needs to see them rather than wait two to three years after their clinically intended review date. She said there is currently unequal access to services in Northern Ireland. “There is a bit of a postcode lottery of MS services in Northern Ireland," she said. Lynne Armstrong (68) is a former teacher from Drumbo and has secondary progressive MS.
She described current waiting times to see a consultant as “totally unacceptable”. “To wait 18 months for a review appointment just means that you develop symptoms, you worry about them and you just think to yourself ‘do I not matter anymore’? I just feel that I’m being written off. “I know what it’s like to not have an appointment, not to be able to go and see somebody, not to have someone say to you ‘this is happening but we can help you’. So for anybody to have to wait for a first appointment is just totally, totally unacceptable. “Patients are upset, frustrated and concerned and I think the Northern Ireland Assembly have to take this very, very seriously. Approximately 180 people are being diagnosed in Northern Ireland each year so what’s going to happen? The waiting lists can only get longer. Siobhan Allister (55) lives in Irvinestown and was diagnosed with MS seven years ago. She is the lead support volunteer for the MS Society Fermanagh branch. She said: “When I was diagnosed with MS my only option was to see a consultant privately in Belfast, which was 180 miles round trip. “I live in a rural part of Northern Ireland so I could have been waiting between 18 months and two years to be seen at my local hospital. “I know this is still the trend and it is not acceptable. Being a support volunteer for the MS Society in Fermanagh I can see the affect this has on some people. This includes depression, feeling very alone and also frustration when they cannot see a consultant or MS nurse. Neurologist Dr Gavin McDonnell is based in Belfast City Hospital. He told Detail Data: “The waiting times are really dreadful. 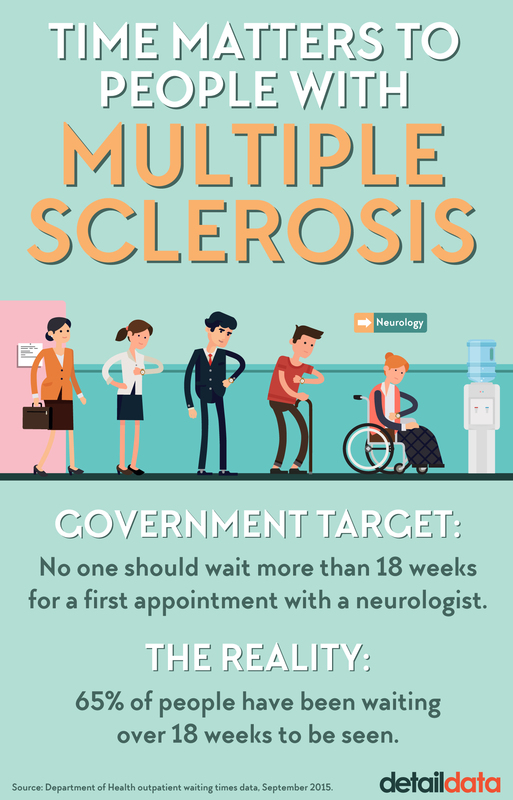 There is a major problem for MS patients in terms of access to neurology for a first appointment despite mounting evidence which shows that earlier diagnosis leads to better outcomes. “For those known to us who are waiting to be reviewed by us in three months, six months or a year down the line, there is also a huge backlog for these patients and that is getting longer and longer. We have patients waiting for over two years past their intended review appointments. “There are no advantages to patients in delaying their diagnosis and treatment as brain and spinal cord function can be irreversibly lost. “At the City Hospital where I work there are about 100 patients attending my MS clinic who are more than a year past when they should have been seen. This will be the case for several hundred MS patients across N Ireland. This is an issue of patient care and safety as we need to make sure that they are being monitored and on the right drug modifying therapy. Dr McDonnell said that more clinics, with multidisciplinary input, are needed to meet the demand. “The Department of Health has recently been investing in the new patients waiting but a lot of that money ends up being spent in the independent/private sector on initiatives that are not sustainable. It deals with the problem in the short term but then the waiting lists just grow again. “We also need greater equity of care across Northern Ireland with access for all patients to nurses, therapists and doctors who have expertise in MS. There are parts of Northern Ireland with limited resident neurological input and specialist care. “The proposed MS network is about making sure that people have a high quality service in Belcoo, Bangor or Bessbrook. Some patients currently have to drive past places like Craigavon or Daisy Hill Hospital to come to Belfast. It can be very distressing for patients with mobility, bowel or bladder problems to have to travel significant distances for outpatient appointments. Dr McDonnell said he would like to see an understanding from local politicians that there are significant issues in neurology. “The equity problem should also be of concern to all Assembly members,” he added. It’s not only patients with Multiple Sclerosis who are affected by the waiting list backlog. Nicola Moore is secretary of The Northern Ireland Neurology Charities Alliance (niNCA) and country director of Parkinson’s UK Northern Ireland. She said: “The current waiting times for new and review appointments in neurology across Northern Ireland are having a significant impact on everyone living with a neurological condition. We put a series of questions to Health Minister Simon Hamilton based on concerns raised by the MS Society, patients and consultant Dr Gavin McDonnell. In response, Mr Hamilton said: “We are facing a continuing growth in demand for elective care services largely due to demographic factors, people presenting with more complex conditions and the availability of more effective treatments. “The factors behind the lengthy waiting times for neurology appointments are similar to those for many other specialties – namely, the demand for outpatient consultations in neurology currently exceeds capacity, resulting in increased waiting times. At the same time, there has been an increase in referrals. “It was extremely frustrating that £9.5million was being lost back to Westminster from Northern Ireland’s public finances every month as a result of welfare reform being blocked. Such a sum could have funded many thousands of assessments across many specialties. The Minister said he has asked the Health and Social Care Board to work with each Trust to minimise waiting times this year. He continued: “The department appreciates that this will be challenging, especially within the constraints of the current financial position, particularly given the increasing number of referrals. It is important to be clear that patients both at initial and review appointments will be prioritised on the basis of clinical need. “One of the many ways we are addressing this issue is by carrying out a regional workforce planning exercise which is currently underway and is due to report to my department in 2016/17. This will inform the appointment of further Consultants and training posts. Mr Hamilton said that significant annual investment is made every year in MS specialist drugs for patients in Northern Ireland and the current budget for the service is in excess of £11m. “Northern Ireland has the highest uptake rate for specialist MS drugs in the UK and at December 2015, there were 1,899 people on active treatment. “As at December 2015 there were 32 patients waiting to commence treatment, with no patients waiting longer than the 13 week standard and the service is therefore substantially compliant with the department’s established standard waiting time for this therapy. “The HSC Board is not aware of any delays in patients diagnosed with MS commencing treatment for MS.
Click here to access the Department of Health's waiting time data on Detail Data's Open Data Portal. 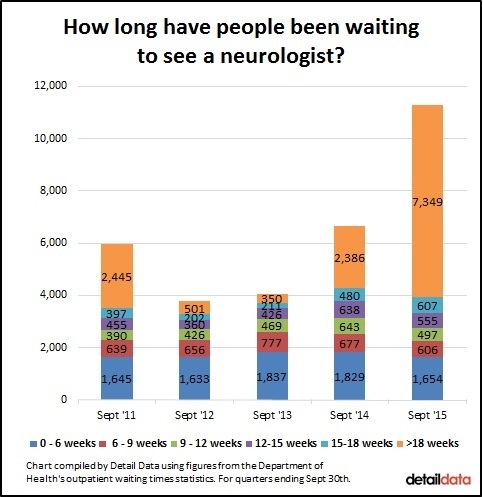 We looked specifically at neurology which is the medical specialty concerned with diagnosis and treatment of disorders of the nervous system, including MS. Our analysis shows that, as of September 30th 2015, 65% of the 11,268 people waiting to see a neurologist had been waiting over 18 weeks. And 80% had been waiting over nine weeks. How much the EU funds NI agriculture: Should we stay or should we go?